Last week’s Xbox Windows Phone Black Friday sale was the largest sale the platform has ever seen, with no less than six Xbox titles discounted. And in fact, the Windows Phone Store hasn’t updated yet, so you can still get those games on sale as of this writing. I have to bear some bad news though… Microsoft has revealed to us that the popular Xbox Deal of the Week program will be taking a break for the remainder of the year. Presumably it will restart sometime around January 2nd. This news comes as something of a blow to the Deal of the Week program, which already endured a hiatus from August 8-29th of this year. That time off seemed to stem from a combination of the Windows Phone Store going through severe technical issues and Microsoft’s PR team finding themselves too busy with other projects. The decision to halt the Deal of the Week after a major sale of six games begs the question: couldn’t the six games have been spread out as weekly sales for the rest of the year? Counting last week, that would be the perfect number of games for the remaining weeks of 2012. It’s almost like these games were originally planned as Deals of the Week until somebody at Microsoft realized they would need an Xbox Windows Phone promotion to go along with the major XBLA and Games on Demand sales taking place over Black Friday week. They bought some good will by throwing so many games on sale, to be sure… but at the cost of five subsequent weeks of disappointment for fans of the weekly sale program. Now, the ’Best of’ description for some of these games is somewhat debatable. I found Hot Pursuit to be an awful grindfest of a racer, and Fragger is not bad but easily trumped by both Monster Island and the recent releases of Angry Birds Space and Star Wars on Windows Phone 8. We did put Chickens Can’t Fly and Wordament on our Must-Have Xbox games list in May though, and Civilization Revolution made our general Must-Have Games list the month before. Regardless of the games chosen for the promotion, it’s still one of those promotions that don’t include an actual sale. Microsoft will simply be pushing the titles through a page on our phones somewhere and presumably the web. That said, Microsoft listed Mush at its current sale price (which started last week), so we’re looking into whether it will remain on sale for the rest of the year. One last bit of Xbox Windows Phone Store-related news. As you might’ve noticed, the Xbox version of AlphaJax still hasn’t become available... Despite the nag screen that currently appears in the indie version and doesn't actually function. The lack of availability could be due to a late Store update (which happens from time to time), or the Xbox release may have been pushed back slightly at the last minute. Developer Marker Metro has made no comment on their Twitter account this week, so we can’t tell just yet. 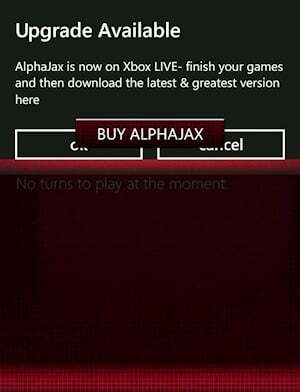 Windows Phone Central will let you know as soon as the new AlphaJax pops up, dear readers! Update: Marker Metro confirms that AlphaJax won't be upgraded until a future date - possibly next week. Thanks to Jey Si for the screenshot.